Wellington Plastering is a well established, local plastering company Wellington, Somerset. We provide complete plastering services from start to finish, alongside rendering, building, painting and decorating services across Wellington, Taunton, Somerset and North Devon. We have a dedicated team of fully qualified plasterers who have a massive 25+ years experience in all aspects of the trade. 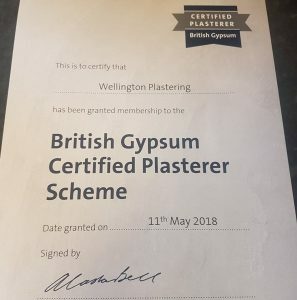 Our plastering company is completely qualified and certified by British Gypsum, to ensure our customers are given complete piece of mind in knowing they will only receive the best quality plastering services. We focus on giving our customers a personalised service based entirely around their requirements and project specifications, which you can see in our portfolio. We feel it is important to always demonstrate a friendly, custom and respectful service through treating our customers exactly how we would want to be treated ourselves. This is vital for securing repeat business for our plastering company as it helps boost our referrals and recommendations from happy customers. Equally, health and safety is of paramount importance. We care for our team and everyone who will potentially be entering the job site at any point throughout the project. With our team being fully qualified and insured, there shouldn’t be any issue or problem with this at any stage whatsoever. With a 9.91/10 rating on Checkatrade and a 5 star rating of Facebook, we’re confident we’ll be able to help if you’re looking for a plastering company Wellington, Taunton and Somerset. 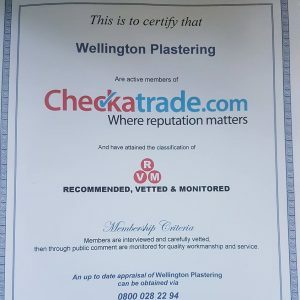 The mission at Wellington Plastering is to make sure that people in Wellington, Taunton and the surrounding areas within Somerset and North Devon with top quality and affordable plastering services. We want to grow to become the best plastering company within Wellington and Taunton and be known as a local, go to business for plastering, rendering, building, painting and decorating. Feel free to see our work in our portfolio. Our values are simple. The customer comes first. We tailor our services entirely around our customer requirements and will always be more than happy to be completely transparent through free quotes and consultation. Copyright © 2019 Wellington Plastering. All Rights Reserved.